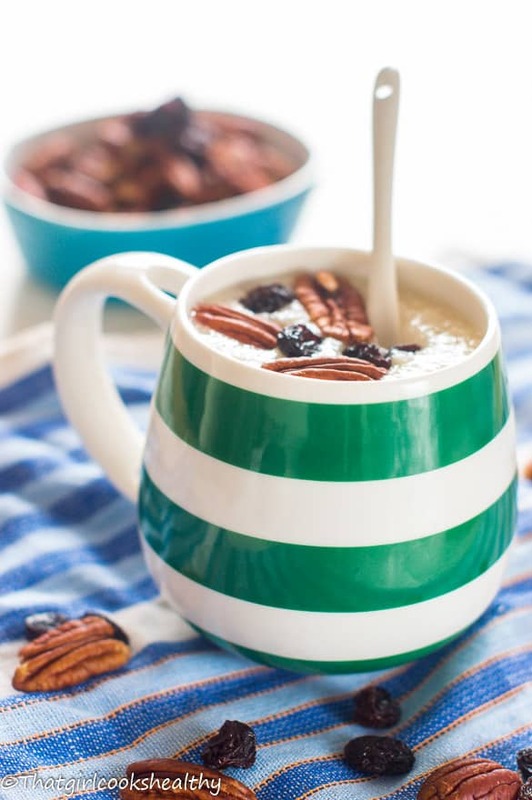 Creamy millet porridge – bored with oatmeal? No problem with supergrain called millet it’s one of many gluten free breakfast option topped with fruit. If you’re totally bored with the idea of consuming oatmeal for breakfast then how about trying some creamy millet porridge instead? It took me awhile to get into the swing of eating millet. Before I go any further with discussing the recipe to hand, please note that millet is not a true grain, rather millet is classified as a pseudo-grain (a “grain” which behaves like a seed). This explains why you won’t see millet incorporated into the paleo diet – because of the grain-seed like behaviour. Let’s not worry too much about labels as the good news is that millet is completely gluten free and works in tandem with the digestive system. For this reason alone I would highly recommend my readers who are either celiac or wheat intolerant to try some millet in the mornings – Keep in mind there are two main variations – seeds or the flakes. I personally prefer to prepare the flakes and make into porridge. The texture is surprisingly smooth and not coarse like oatmeal. In fact I would describe the texture akin to cream of wheat if you know what that is or semolina. Adding millet to the saucepan – whether you are using millet seeds or flakes, either texture needs to be added to a saucepan along with the milk and water. Yield texture – The millet mixture needs to be stirred and heated through until it thickens. How thick you want your millet is your preference. My recipe is a medium texture – not too thick/thin. Adjust liquids accordingly if you want a different texture. Add cinnamon – add the cinnamon after the porridge reaches it’s desired texture. 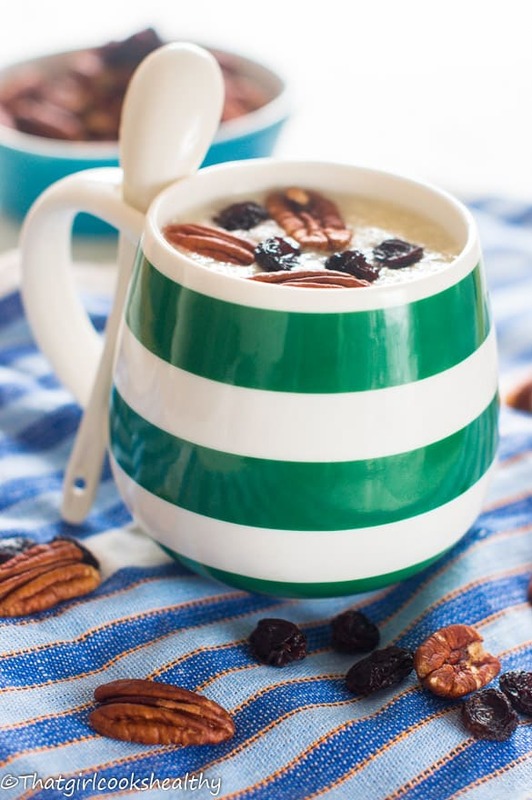 The topping – add your chosen topping (pecans and raisins) upon serving. 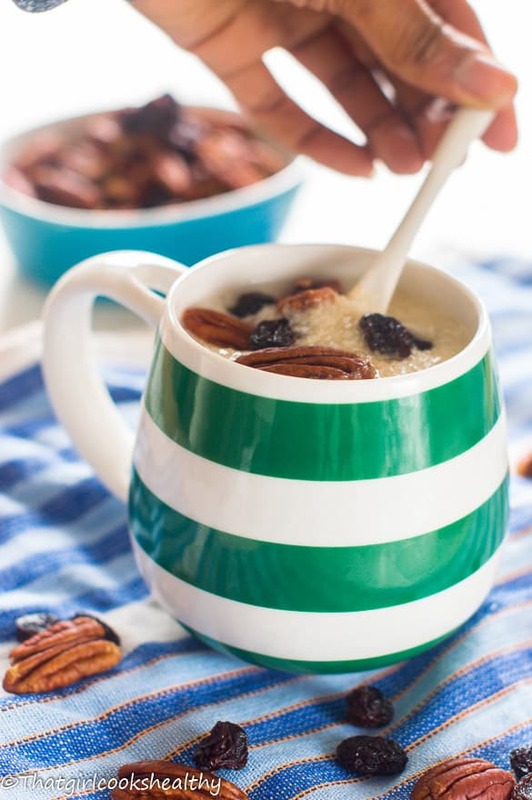 As millet porridge is quite plain adding a hint of cinnamon, vanilla with a handful of raisins and pecans – really boast those flavours. 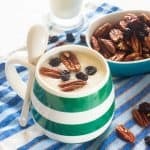 There is a slight after taste if not prepared with nut milk, so adding some nut milk is beneficial for reducing the subtle bitterness. Is millet porridge good for diabetics? On low-medium heat, add the millet flakes along with the water and almond milk then proceed to stir. Continue to stir until the flakes begin to dissolve and the texture thickens. This should take 5 minutes or so. As the porridge thickens, reduce the flame to low, add the cinnamon and cook for a further 2-3 minutes. Feel free to stir in some raisins if you wish. 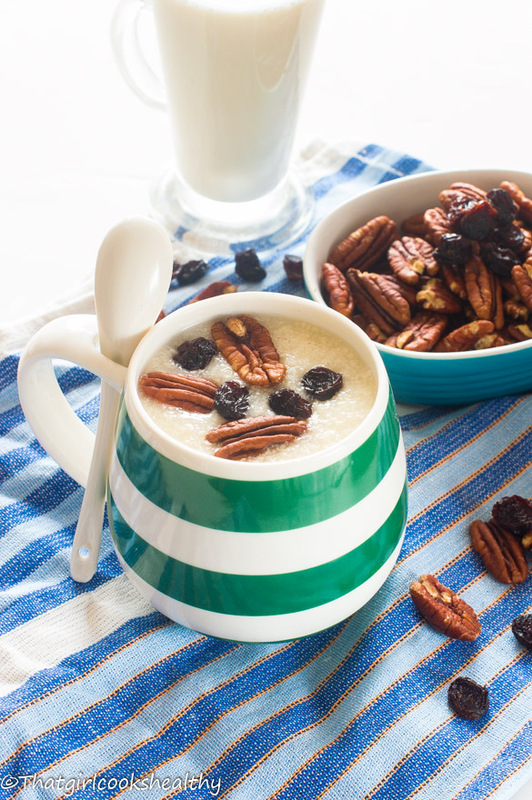 Alternatively, you can garnish with a handful of raisins, pecans and drizzle with a sweetener of your choice. How delicious looking! Great idea, and I love adding tons of mix ins like those nuts and berries, yum! I don’t think I’ve ever made millet before, but this reminds me of cream of wheat — haven’t had that in years! gimmmeee oh and those are the best spoons! I just found a bag of millet in my pantry and was wondering what I’d make, thanks for this! It’s been a long time since I’ve made millet porridge! Now I have a craving. I think a little maple syrup and some pecans in it would be perfect. Thanks Annemarie. Definitely give it a try!